I always serve fruit-based desserts instead of traditional baked goods, these cheesecake bites are one of my go-to recipes for entertaining in the spring or summer. Compared to just a “sliver” of strawberry cheesecake, which packs in about 300 calories and 18 grams of fat (most of which is the unhealthy saturated fat), these bites have about 40-50 calories and are low in fat yet get high scores for nutrition. In mixer bowl, beat together cream cheese, sugar, lemon juice and lemon peel until smooth and creamy; set aside. Using paring knife or small melon baller, partially hollow out top of strawberries to a depth of 3/4 inch. Gently fill each with about 2 tsp cream cheese mixture. Roll tops into graham cracker crumbs. Arrange on serving platter. Makes 20 servings. 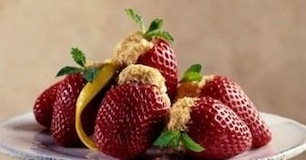 Tip: To prepare recipe ahead of time, fill strawberries with cream cheese mixture; cover and refrigerate up to 6 hours. Roll in graham cracker crumbs just before serving. Ah…strawberry season again. Great recipe. And I like that is is not high-calorie! I will be trying these for Mother’s Day tomorrow. Thanks for the recipe!